Q: I need to replace the fuel pump on my Case 446 garden tractor. The pump is defective – the tractor will not fire when cranked unless I pour a little gas in the carburetor. Then it will run fine until the gas is gone. Do you have the parts to replace / or rebuild the unit? If not would you recommend using another 12 dc pump on the gas line that would be activated when the key is turned on? A: Yes, just install an electric fuel pump in series with the current fuel pump and carburetor. Q: I have a case 446 garden tractor built in 1974. The starters drive gear will spin but will not go forward to engage the flywheel. That’s problem number one. Problem number two is the front shield. My brothers solution is to cut the shield to gain access the area to remove the starter. I would like to avoid this at all costs. A: You need to remove the engine, and remove the fan shroud, and then unbolt the starter. 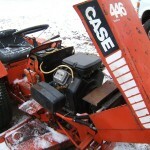 Q: I just bought a Case 444 garden tractor and I am having problems getting it to run. When I bypass the solenoid it will just go clunck, clunk. It acts as if it is not getting any fire. I changed the coil, sparkplug, and wire. I just bought a new solenoid. It’s getting gas b/c it is running out of the air filter. What do you suggest? A: By going clunk, clunk, are you telling me the starter and engine are not turning over? If that is so, it sounds like you have a shorted starter, or a starter with an open circuit. Q: I have an Ingersoll 448 garden tractor. I was reading about the repowering you’ve done and am quite impressed. I think I will do it later during winter season. I think the price is great and it sounds very easy. I do have a question for you. I’ve tinkered with this mower for years now and it’s been very reliable. Recently the battery light has been staying on, lights are dim and the battery eventually runs down and needs to be charged to start it. I just replaced the rectifier/regulator and it still stays on. There’s a little metal capacitor looking device with 3 wires (1 going to the starter relay, 1 going to the battery light and 1 going to the negative battery terminal). Do you think this part is bad? I guess the key switch may be involved too as I look at the wiring diagram. What do you suggest? Also, this mower surges when running. It’s a steady constant rev and decline. when I mow, I don’t notice it at full throttle but when i slow the engine it begins again… hot or cold. I noticed that when it pulls itself under a slight load, it quits too. The only other remedy is to pull the choke half way out and it idles smooth. I changed the fuel and air filter and it still does it. A: I think you need to check if the center wire on your rectifier is hot with the ignition on. If it is not hot, that is your problem. The second test you need to have an AC voltmeter and check the two stator wires with the engine running and they should be putting out 24 to 36 AC volts. If it is not the stator is junk and I would not fix that as it also sounds like you are having Onan governor problems. Q: I am getting ready to purchase a gently used (290 hours!) Ingersoll 3014 with a Vanguard V-Twin 14hp engine. Does this tractor still have the mechanical PTO clutch like the old Case 22x / 44x series? A: No it will already have the new electric clutch on it. Q: I have a 446 Case garden tractor with a B43M Onan Engine. I have replaced the coil, but I am still not getting any spark across the points. Is there a kit or a way to wire up two coils ? A: No, there is no reason to hook up 2 coils, you should check out your primary side bracket first.